"No. 61. Standing in the center of Sunnyside Avenue, between Genesee and Hamburg streets in Sunnyside, looking westerly towards projected extension of Sunnyside Avenue through San Miguel Ranch." 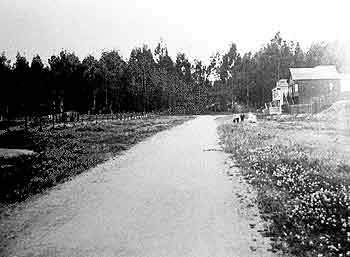 Sunnyside Avenue was indeed extended through the ranch. The street name was changed to Monterey Boulevard and the road wound between the new developments of Westwood Park and Westwood Highlands, terminating in St. Francis Wood. Images: 1) A.S. Baldwin report on Sutro Estate, 1912. 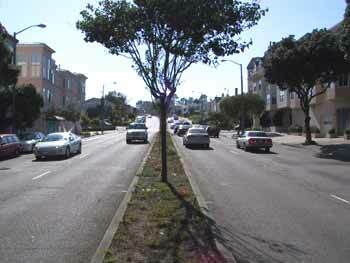 Courtesy of the San Francisco History Center, San Francisco Public Library; 2) WNP photo, August 2002. Page launched 1 September 2002; updated 30 September 2005.